It was a long wait but nevertheless a worthy and much welcomed one. Despite analysts' prediction of a shrinking plasma TV market share, the big three--Pioneer, Hitachi and Panasonic--are fighting back with newer and better plasma entries. A new battleground is emerging and Panasonic is one of the forerunners with an affordable Viera TH-50PY700H, the first full-HD plasma TV to hit below the Singapore S$10,000 (US$6,578.82) mark. In fact, it's also cheaper than most, if not all, 46-inch 1080p LCDs out there. How's that for a made-in-Japan panel? The TH-50PY700H is truly a heavyweight that simply dwarfs the other review units in our Labs. Measuring 1,266 x 802 x 138mm, it's like most other Vieras in that it has a side profile with a slim top and heavy bottom. For the minimalist, it offers plenty of clean lines and a clutter-free front, dressed in a combination of matt and glossy blacks. The latter is used for its plasma panel frame sandwiched between a pair of streamlined speakers lined along the sides. 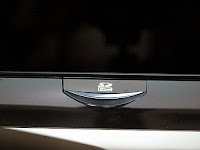 The entire 48kg TV is, in turn, supported by a sturdy but fixed diamond-shaped pedestal stand. 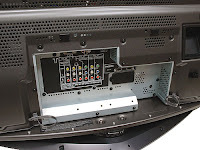 To allow maximum installation flexibility and ease of use, its designers have the onboard TV controls and auxiliary A/V inputs housed beneath a flip cover. The same stealth approach is extended to the blue-lit SDHC card slot mounted on the bottom front, ideal for recessed feature walls. That said, sufficient clearance is definitely recommended for this hot-running panel, cooled by three silent thermal-controlled fans on the rear. The wall-mounting bracket is available for S$180 (US$118.42), while cable management provision is a standard. Panasonic is bundling the same eye-catching remote controller we have seen for the earlier 2007 models. 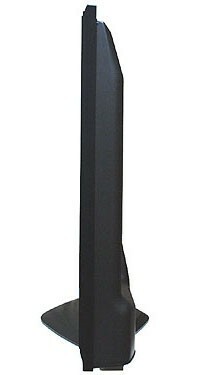 This curvy stick offers multifunction capability out-of-the-box with support for its DVDs and VCRs complete with dedicated playback and recording controls. We were particularly fond of the tactile and responsive feedback provided by the oversized buttons, though video switching could have been better. This is implemented via a separate TV and A/V toggle key with no active signal filtering--imagine scrolling through nine sources. It's another love-and-hate affair for the stylish software menu. First-time flat-panel owners will probably find the onscreen guide and simplified submenus a blessing and breeze to navigate. Having said that, the miserable selection of advanced settings is likely to be a major turn-off for the tech-inclined. In fact, diving deep into the menu registered little more than dynamic color management and noise reductions settings, hardly relevant for an indepth SpyderTV Pro calibration. If you need extra help in deciphering the technicalities, a well-illustrated user manual is in hand for quick and easy references. 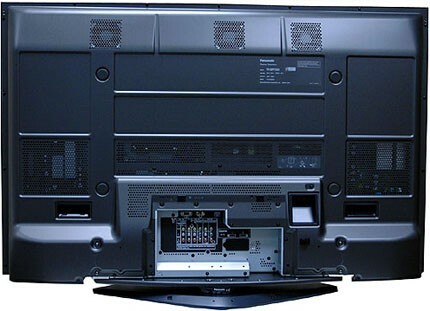 This Viera is the first of its kind from the company to feature a full-HD plasma panel. Aside from the belated resolution boast, this generation-10 panel delivers no distinct advantage over its HD-ready equivalents. The dynamic contrast and color depth are still pegged at a respectable 10,000:1 and 68.7 billion, respectively. The former is a far cry from the class-leading 20,000:1 rating of the Pioneer Kuro. On the plus side, it has inherited the G10's matt-finish, anti-reflection coating which is far more effective than the Pioneer's, enhanced with an extended 100,000-hour service life. To match the future-proofed display, the TH-50PY700H has been upgraded with a new proprietary V-real II Pro video engine. The main difference here over its predecessor is improved 16-bit processing power tailored to cater for the high data bandwidth of full 1080p signals. On the audio front, there is the beefed-up 31W Smart Sound Speaker system centered on a four-driver array configuration. The ensemble is made up of dual low-frequency woofers and treble-oriented twin tweeters. An optical digital audio output is also available to channel stereo sound to external home theaters. Another value-added function is its onboard JPEG playback. Imported through a single-slot card reader, the Photo View Mode is compatible with up to 10-megapixel shots and an assortment of media ranging from SD to MMC and up to 4GB SDHC. Automatically activated after a flash memory card is inserted, the system presents a convenient overview of the digital album in a 4 x 3 thumbnail grid complete with date and resolution. Furthermore, options are aplenty for manipulating images such as rotation and customizable slideshow with programmable display interval and looping. Little has changed for connectivity compared with the TH-42PV700H. 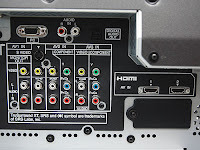 You will still get a trio of Viera Link-compatible (HDMI-CEC) HDMI terminals: One in front and two on the rear. What's missing here is native 24Hz film format compliancy with only standard 1080p50/60 input signals supported out-of-the-box. On the bright side, its dual set of analog component-video sockets are favorably equipped with similar HD signal handling. That's a total of five 1080p-ready inputs, putting aside the Mac-friendly computer and usual spread of legacy S-video and composite A/V jacks. Before we dive into the review proper, it's worth noting that the panel was quite resilient to burn-in even after prolonged exposure to static station logos and news tickers. The LCD-like matt-screen treatment also did an admirable job suppressing reflections which had a positive impact on daytime viewing. Touching on off-the-air broadcast picture quality, we had no major concerns over the mild dot crawl sometimes visible around high-contrast areas. This was absolutely acceptable considering the grain-free and relatively sharp visuals garnered throughout most TV stations. The lack of ultra-high contrast did show up during the synthetic Avia test patterns where the panel struggled to differentiate the deepest black. Just to qualify, the black level is generally better than most LCDs we have seen, but not quite on par with the Pioneer Kuros. Perhaps as a consolation, the TH-50PY700H did manage to regain some ground with perfect color decoding. The same went for 480p DVD upscaling which came pretty close to our standalone Pioneer. Numerous runs of Ghost in the Shell 2: Innocence revealed little offending jaggies though the picture was a little soft to our eyes. Interestingly, playing back native HD content had varying effects on the overall picture sharpness. Some Hollywood productions such as the dark scene-infested Ghost Rider Blu-ray title were skewed toward natural film-like quality rather than the familiar razor-sharp clarity of animations. Even better, shadow detail turned out better than expected despite the above Avia observation, with visibly intricate patterns on Nicolas Cage's leather jacket. Switching over to the HD-DVD HQV, the Viera successfully tackled most evaluations but fumbled in our Film Resolution Loss test with strong onscreen flickering. To check out its motion reproduction capability, we fired up Ridge Racer 7. The 1080p computer graphics was rendered faithfully with solid fidelity, clear scrolling text and smooth corner-to-corner panning shots--a strong testament that the panel still has what it takes to put on sharp images. Unfortunately, the same could not be said for the PC input which maxes out at 1,366 x 768 pixels. As expected, the extrapolated text was soft and the huge screen did little to conceal the flaw. Another major surprise was visible mild banding on circular and diagonal patterns exhibited from a color chart. It has been a rollercoaster ride thus far, but this is about to be dismissed by its JPEG and audio playback performance. Loading time for the thumbnail was blazing fast and almost instantaneous, while it took a mere 5 seconds to load a 5-megapixel file, displayed in near-print quality and original distortion-free aspect ratio. The dual woofers also proved their worth piping out clean, punchy bass notes without signs of strain even at a reference level or 55 percent maximum volume. Besides the added oomph, treble was adequately extended much to our likings with good stereo imaging to boot. 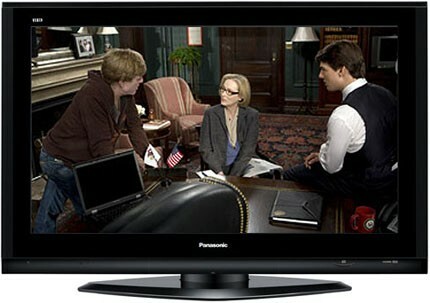 The Panasonic Viera TH-50PY700H is an encouraging full-HD attempt by the stanch plasma advocate. Though there are obvious shortcomings such as a less-than ideal software menu and occasionally soft pictures, it's hard to fault the panel with its newfound affordability. At S$6,999 (US$4,604.67), it's S$1,300 (US$855.99) pricier than the latest Hitachi P50X01A. However, the latter is based on an ALiS panel which is known to flicker due to its inherent interlace design. This was improved over the years but is still an ongoing concern especially for sensitive users. With this in mind, we decided to go ahead with an Editors' Choice for this Viera.